I’ve been considering using TokuDB for a large dataset, primarily because of its high compression. The data is append-only, never updated, rarely read, and purged after a configurable time. I use partitions to drop old data a day at a time. It’s much more efficient than deleting rows, and it lets me avoid indexing the data on the time dimension. Partitioning serves as a crude form of indexing, as well as helping purge old data. I’m not sure this is true for my use case, for a couple of reasons. Secondly, data size matters a lot. If I need to create a redundant index on the timestamp dimension, no matter how good TokuDB’s compression is, it’ll inflate my storage and I/O costs. And make my backups bigger, and so on, and so on. I don’t want an index that I don’t need. My queries operate very efficiently without the timestamp index, and creating one only to help delete older data fast wouldn’t make sense. In the end I got sidetracked and decided to write this blog post. 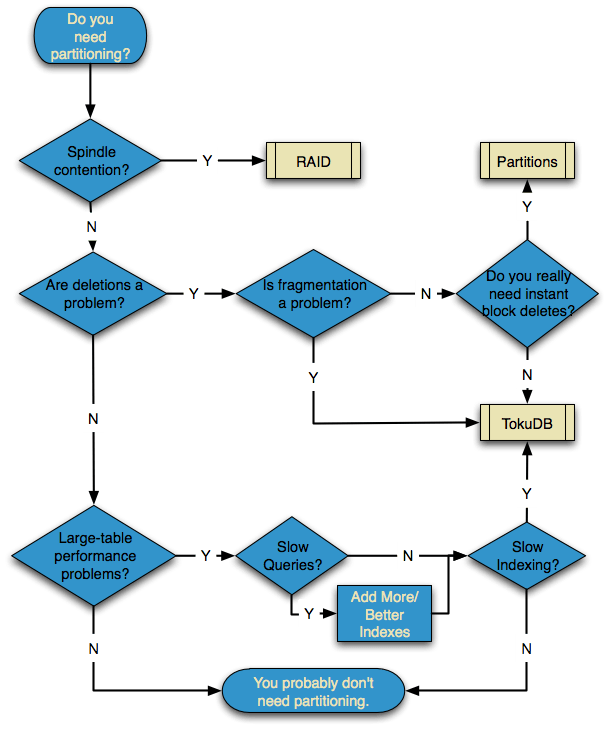 And I didn’t find out whether TokuDB supports partitioning or not! Silly me.